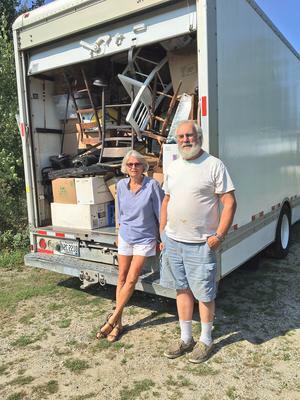 Suzanne Decrow and Joe Thompson, local boat builder and owner of Joe’s Garage, are all set to transport more than seventy long tables of Junque for Jesus to the Blue Hill Fairgrounds for the annual St. Francis Fair this weekend. Thompson will contribute all the tools and equipment that have been collecting on his side porch for the fair. A popular feature of the Fair, which is now in its 29th year, Junque for Jesus can be one-stop shopping for anyone looking to furnish an apartment or find a unique treasure. In addition to Junque there will be thousands of books, half a dozen brand new bikes at Granny’s Attic (at a huge discount), elegant “Art and Treasures” and the Gentlemen Grillers with Bianco Sausages, hamburgers and much more. Admission to the Fair is free and coffee and doughnuts will be available outside the gates at 8 am. Come for the Junque, but stay for the children’s activities, face painting, games, hayrides and music. The Fair takes place from 9 a.m. to 1 p.m. and will benefit not only the church but the SPCA of Hancock County, this year’s fair partner.